With Summer in full force the heat can be oppressive. All of us are trying to find fun ways to relax and wait until the sun goes down. Many kids are out of school in need of a diversion and something to do. Movie theaters are a great escape but if you have a family it can be quite costly. Never fear, Bookmans Entertainment Exchange has solutions. 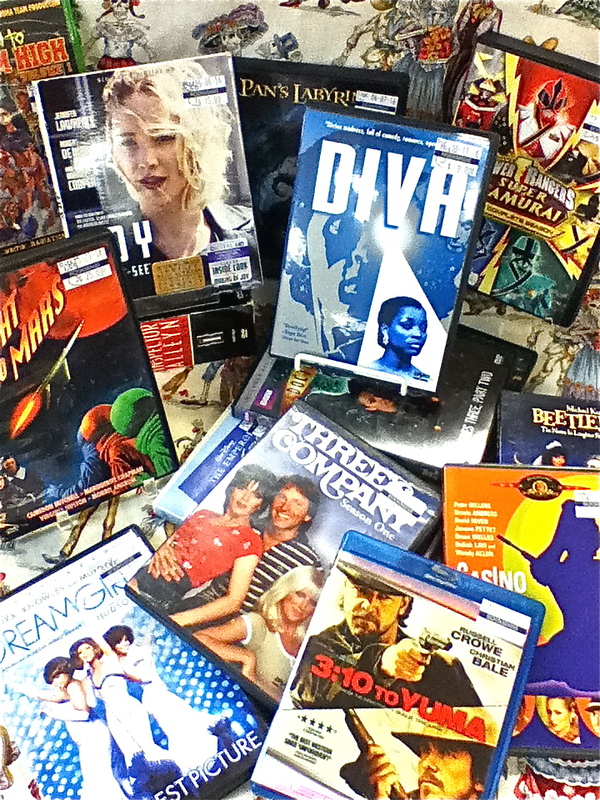 New releases and timeless classics make their way to our shelves daily. These Summer movies can be purchased with that trade credit that’s been burning a hole in your pocket. Don’t sweat it, literally. We have plenty Summer movies including blockbusters, cult classics and family friendly films that are sure to help you stay cool. This Roger & Ebert “two thumbs up” title tells the tale of arrogant Emperor Kuzco who finds himself turned into a llama. The digital animation and witty dialogue are incredibly funny. The star cast includes David Spade as our king of the castle turned farm animal as well as Eartha Kitt, Patrick Warburton, and John Goodman who are adept in giving the innuendo filled humor the perfect spin. This movie is entertaining on multiple levels, parents will roar with laughter at some of the wry jokes and kids will enjoy the slapstick antics of our erstwhile heroes. This action packed 3 disc set will keep kids entertained for hours. Manster Xandred’s monsters battle our Power Rangers as the Sanzu River rises. The Samurai Rangers will have to unlock the power of the Black Box to battle the mysterious Nighlok Serrator and become Super Samurai! This complete season set includes bonus features and the appeal of these iconic characters is timeless. In case you forgot, remind yourself why you loved this series in the first place. If you haven’t moved your way through the discography that is classic ’70s television, Three’s Company is the perfect place to start. Season One sets the stage as three unlikely singles find themselves living together as roommates. John Ritter, Joyce DeWitt and Suzanne Somers are joined by seasoned vets Norman Fell and Audra Lindley for outrageous slapstick and scandalous comedy. No one does mystery like the Brits and this BBC production is one of the best. Patrick Malahide plays the gentleman detective created by novelist Njaio Marsh. Marsh’s love of art and theater give this series an elegant and quirky quality. The series is famous for being part of the ‘golden age’ of British mystery. This series has maintained its appeal for decades. Fans have their favorite Doctors and debates can become heated. If you are new to Who we suggest the 2005 series with Christopher Eccleston as our beloved ninth doctor. Travel with Time Lords and become a devout Whovian with this timeless science fiction/fantasy series. The visually stunning epic and 3 time Academy Award winner Pan’s Labyrinth is great film for anyone who is a fan of fantasy. The film is often compared to The Lord of the Rings trilogy for its sweeping story, fantastical worlds and noble quests. Directed by the famous Guillermo del Toro, the tale’s main character Ofelia discovers a mysterious labyrinth and sets upon adventure to save herself and her beloved mother. Flight to Mars is epic camp at its finest. This Cinecolor film was released in 1951 and has been remastered for modern viewing. Four men and one woman land on the red planet after sustaining damage to their craft in a meteor storm. Our adventurers discover a highly advanced culture below ground but are they our allies or our enemies? This nostalgic science fiction classic is a must see for fans of the genre. Imagine a New Jersey before Snookie and her crew moved in. Goo spewing mutants, taco crazed teens and a dancing duck give you an accurate idea of where this film is headed. Be prepared for gore, slime, crude jokes and apocalyptic scenarios conquered by teenagers who just learned to drive. Don’t spend your summer bored and sweating – get caught up on the best of film and television. What are some of your fave Summer Movies to watch in these hot months? We want to know! Tell us in the comments below or better yet stop in and say hi. Our expert buyers are always down to #Geekout with a fellow film fanatic. Happy Summer! ***Bookmans is you store to explore. If you are interested in an item mentioned here, give your local Bookmans a call and one of our staff members will be happy to check our shelves.